Hello lizard friends! My name is Maria Jaramillo and I study Neuroscience in Dr. Johnson’s lab at Trinity University. Here, I get to look at lizard behavior to understand how a lizard’s behavior is related to activity in its brain. Every time you see something, information is sent to your brain. The brain takes this information and then tells us what to do with it! Lizards use several different types of behaviors to send messages to other lizards. A lot of these messages are sent using color (like when you blush because you’re embarrassed) or motion (like when you wave your hand to a friend). 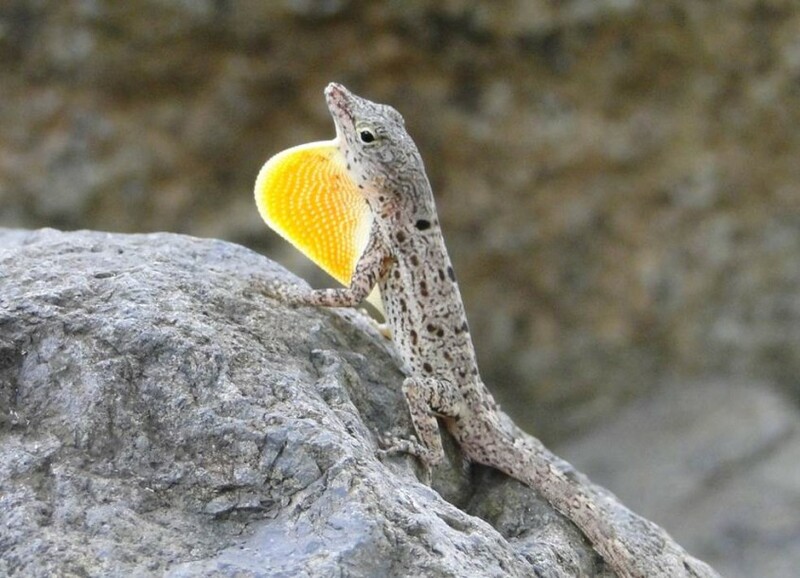 We call these types of messages “visual cues.” An example of a lizard visual cue is shown in the picture above, where the lizard has extended his bright orange throat fan to let another lizard know he is mad. Visual cues are processed in the brains of other lizards, which then tell the other lizards how to respond to the message. How does the brain get the visual cue and make a response? Visual cues are first seen by the eyes, and then are sent to the brain. The brain is made up of millions of cells called neurons. Neurons are all connected by tiny spaces that send information (like the information in the visual cues) from one neuron to the next. Think of it as if your entire class was in a straight line and you wanted to take a bucket of water from one end of the line to the other end of the line. You would have to pass it from person to person. Neurons do the same thing! They take this information (in your case it is a bucket of water) and pass it to the neurons they are next to. This is how we process information! I want to know if there is a difference between processing information from another lizard and processing information from, let’s say, a green leaf. If the information is from another lizard, then it could be threatening! If the information is threatening, then I believe that the lizard will send this signal differently than it would the color of a non-threatening green leaf. How do I figure this out? I will take lizards and show them each a video of another lizard that is sending information in the form of a visual cue, or a video of a leaf. Then, I will look at the brain of the first lizard and see what was happening in the brain the moment he saw his friend send the cue, or the moment he saw the leaf. So far we have not started with the experiment, but I think our results will be very cool! Don’t you? Maria is a sophomore at Trinity University, majoring in Neuroscience. In her research, she's studying lizard vision, and she loves to play the clarinet!